Are e-gravel bikes the next wave of the future? Yamaha Motor Corp., USA, is unveiling an all-new Power Assist Bicycle prototype called the Wabash today at the Interbike Expo. 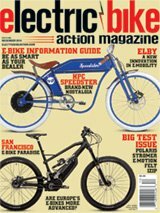 This all-new model is designed and developed for adventure rides, and specifically for the U.S. market targeting the hottest category in cycling – gravel bikes – within the industry’s biggest growth segment – electric bicycles (e-Bikes). Yamaha is showing a prototype of the Wabash at its Interbike Expo booth (#4007). Specifications will be announced soon, but aren’t currently available as of this writing. Stay tuned to more announcements about 2019 bikes, accessories and future goodies!